Like pioneers after a particularly difficult winter, we have finally emerged from the Cowboy Issue deadline slightly weary, a little hungry, but very thankful to be alive. During those times when I thought about crawling underneath the intern desk to cry for a little while, there was something that consistently convinced me that everything would turn out just fine. When I felt like I couldn’t verify another story, couldn’t read a photo caption again, or write one more word, I would simply pick up the phone. It’s difficult to articulate just how I felt after speaking to the cowboys and cowgirls who appear in this issue, whether to interview them for Black Book, to factcheck Holly Hendrix’s excellent feature about rodeo, or just to ask them to borrow a pair of spurs to photograph. No matter how long our conversations lasted, I always came away with a feeling of warmth and respect. I’ve never been called “ma’am” so many times in my life, and no one ever spoke down to me because I didn’t understand what “marking out” a horse meant. This applied to both my first and my eighteenth call—I had to consult him so many times that I think Dale Yerigan, the president of the International Professional Rodeo Association in Oklahoma City, has my phone number memorized. 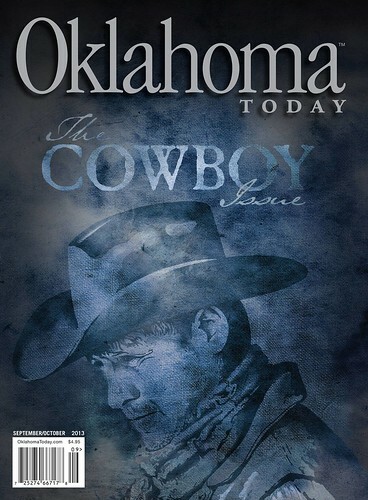 The cover of our September/October Cowboy issue, with a cover designed by Oklahoma Today art director Steven Walker using a photo by California photographer Jak Wonderly. Subscribers will begin to receive this issue in about two weeks, and it will appear on newsstands by September 1. But Yerigan and the other folks continued to treat me with a word that sounds completely anachronistic today: gallantry. I’ve never been one to long for the good ol’ days, but these cowboys make me pine just a bit. They are true men’s men. They are not chauvinists, strutting around with a Don Draper-esque swagger, but tough, independent people who work from sunrise to sunset with a sense of pride in getting their hands dirty, respect for the earth and the creatures that live on it, and the opinion that even strangers deserve to be treated like neighbors. As I got to know our sources, something else struck me. These guys and gals do amazing things—from rodeo tricks with a rope and saddle to providing food for America’s tables—and they do it with the most awe-inspiring humility. In fact, one of the challenges I faced while working on this issue was actually getting these champions of the arena to admit to some of their accomplishments. Working on the special edition Cowboy Issue, I was reminded of a piece of western wisdom I read a long time ago. “You can’t tell how good a man or a watermelon is ’til they get thumped.” After thumping those cowboys over and over, I can tell you that they are a good crop. When readers get a copy of the issue at the end of this month, I hope they enjoy the fruits of our labor as much as I did.